Perched high above the fireplace and right below the flat screen TV is a row of photographs of friends, family and you. Your smart-alecky brother who's visiting for the weekend decides to take down the family picture you took during last year's vacay at the beach. He teases you about your claim that your beloved Boopsie is so smart that he can recognize you in that photo. But can Boopsie really do this? Beth Strickler, DVM of Veterinary Behavior Solutions, in northeast Tennessee, says the question is really two parts: Can a dog tell the difference between the appearance of various people or animals and can they recognize that information in a stationary, two-dimensional image (such as a photo)? head in the photo. But if in another photo his owner's head is blocked, the animal might have a problem figuring out who she is. 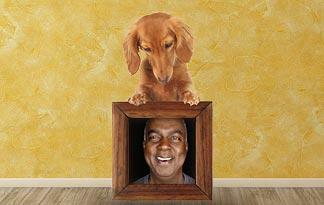 Research does show that dogs can identify a familiar owner in a photograph. In a study published in the Journal of Vision, 12 pure-bred beagles and 12 domestic cats were given individual handlers who worked with them two hours a day for six months. Then they were given a visual test to recognize the face of their handler versus a non-handler. The result? The dogs chose the face of their handlers 88.2 percent of the time, while the cats chose their handlers 54.5 percent of the time. These same test pooches were even able to identify the face of an animal that lived with them. In fact, they chose the familiar animal more often than an unfamiliar animal. The study found that dogs chose the face of a familiar dog 85 percent of the time, while the felines chose the face of a familiar feline 91 percent of the time. However, most dogs don't depend solely on their vision to recognize familiar people and other animals. Dr. Strickler says that's because their other senses are so well developed that many may rely more heavily on smell and hearing. This is especially typical in "scent hounds" and dogs that have a lot of fur on their faces. Dr. Strickler says some of her dog patients have such a clear image of their owners' appearance in their mind that they can't recognize them if they change their image. In other words, if an owner cuts her hair or wears a uniform instead of her everyday clothing, then the dog will more than likely not be able to identify his owner in a picture. She tells the story of a client who had a dog for several years. "He went into the bathroom and shaved his facial hair, and when he came out a few minutes later, the dog did not recognize him and responded aggressively to him," she says. "The dog did not relax and interact with him in the same way until his facial hair regrew." So, if you're going on an extended business trip or family emergency, will being Skyped in or watching home videos help your pooch remember you? We know that dogs can identify their owners based on sight and sound, so it makes sense that they would know them in a video, right? Not necessarily. Dr. Strickler says that dogs don't have the same ability to fuse the flickering light that makes a video image as humans do. Therefore, the image would appear jerky. However, what might help them in a video is hearing the sound of their owners' voices.